New membership program by greencitizen.com gives eco-conscious people an easy and cost effective way to recycle their electronics. GreenCitizen® Inc (http://www.greencitizen.com), a triple bottom line company for responsible recycling of end-of-life computers and electronics in the U.S., today launches the nation's first electronic recycling membership program. For more information about this program, please go to http://www.greencitizen.com/member. GreenCitizen strongly believes that the only way to address the global e-waste crisis is to provide the most convenient, accountable and safe recycling service so individuals and businesses can do their part to save the environment. GreenCitizen® Inc (http://www.greencitizen.com), a triple bottom line company for responsible recycling of end-of-life computers and electronics in the U.S., today launches the nation's first electronic recycling membership program. For more information about this program, please go to http://www.greencitizen.com/member. The program consists of different types of recycling membership levels for individuals, non-profits, businesses, and commercial buildings. With a fixed monthly or yearly fee, members can recycle unlimited number of approved electronic items by either dropping them off or mailing them to the recycling center in Burlingame, California. Businesses have the additional option to sign up for monthly and yearly recycling memberships for scheduled pick-ups at their facility. GreenCitizen also offers data security services such as hard disk destruction and cell phone erasure for additional peace of mind. GreenCitizen only uses electronic de-manufacturers and processors that are certified as e-stewards by the Basel Action Network (http://www.ban.org) and processes that pertain to the highest industry standards. GreenCitizen's Global Total Accountability Management System (GTAMS) provides accountability of recycling items from collection to de-manufacturing. 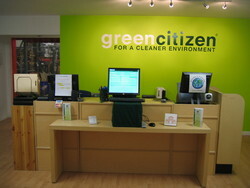 To become a member or view the regular prices for individuals and business pick-up facilities please visit http://member.greencitizen.com. GreenCitizen provides convenient, accountable and safe solutions that make it easy for individuals and business to recycle electronics responsibly; helping to save the environment from harmful electronic waste. GreenCitizen's eco-centers in San Francisco, Burlingame, and Los Altos, provide visits, lectures, community programs, and website informing people about the issues of electronic waste and the importance of responsible recycling. For more information, visit http://www.greencitizen.com or call 650.493.8700 x702.